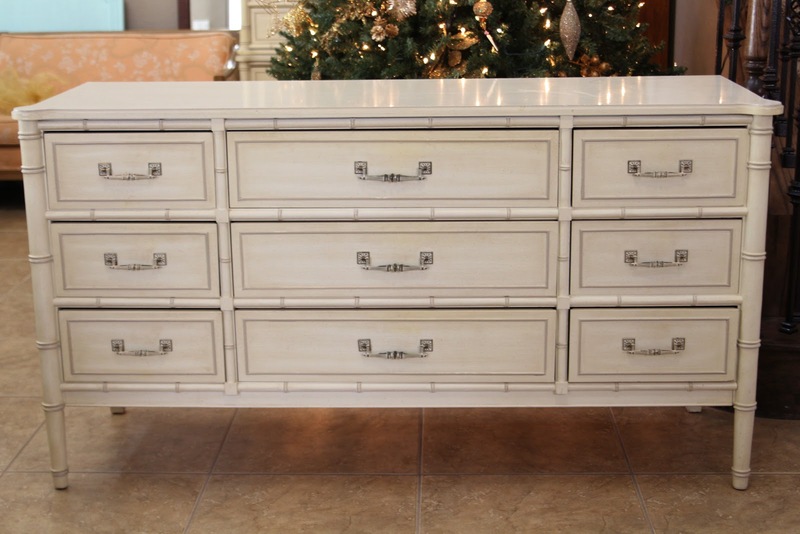 The vintage Bali Hai dresser is finally finished! Bad weather, and more bad weather and a contaminated can of paint made this project stretch on for much too long. But in the end, it was well worth it. Red paint can be quite tricky. Especially trying to get a deep, deep red. I've tested many colors and have tried to have this exact color matched. To get coverage (not sheer), white needs to be added to the formula, but to get this deep, deep red, white can't be added. It becomes muted and loses it's umph. So, Rustoleum's premixed Sunrise Red is the one I turn to over and over (even though it's intended for auto painting). The color is amazing. You can find it in the paint section of any big hardware store. The paint is formulated for brushing and because of that, it's self levels like a dream. Not all oil based paints are created equal in that department. Some don't self level well at all and the result is serious brush marks. You will still see some brush marks, but nothing major. I recommend thinning it a little for easier application. Definitely not necessary though for those who don't want to deal with the mess. It goes on plenty well straight out of the can. 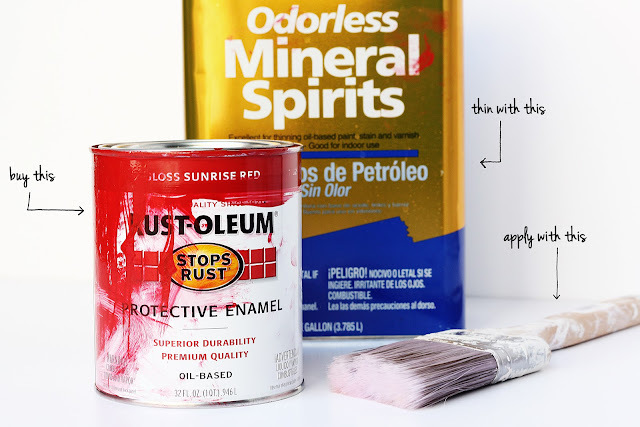 Because it's oil based, you might be tempted to pull out a throw-away foam brush or roller to apply to avoid cleaning your brush with mineral spirits. But it's sooo not a good idea. Foam brushes have a tendency to incorporate air into the paint which creates small bubbles and we all know those are never good. beautiful!!!! that is the exact paint and color i used on my son's chairs and i love the finish and especially the durability!! Thanks! It is super durable! The quality of your work continues to amaze me; that mirror-smooth finish is stunning! Beautiful color and fantastic piece. Thanks for sharing your tips and tricks with the rest of us :). The best compliment ever. Thanks, Brandy. Stunning! And in my favorite color. They have a navy blue as well I know. Have you ever used it and did you like the color? I haven't but I'm going to check it out next time I'm there! I've used their black as well and really like it. Awesome!!! Love the color-it's perfect on that piece! My hubby sometimes uses his car paints on furniture since it's easier to get those deep reds the way they're formulated. I think SW has a line of automotive paint if you ever feel like experimenting with them. What I wouldn't give to pick your husband's brain. There are so many products out there and with all the new waterborne products rolling out, it's hard to know which direction to go! Has your husband converted to the waterborne lacquers yet? I've actually used this color before and love it! We painted a thrift store mirror frame and a small end table - just beautiful. Your larger piece is just amazing though - I love it! Stunning! Gorgeous! Beautiful! Your work is perfection. I love it. Such a treat to see your pieces. Amazing! It's so shiny and pretty! I absolutely love the color and I don't even like red! Gasp! You don't like red??! Love love LOVE this - so gorgeous! The colour is amazing and the finish is totally perfect! Hi, I am sorry if its a silly question...;) I have a piece that is striped and ready to go. So could I just paint my piece as you have? Do I need to prime? I prime all my furniture since I sell it, but I used this same product in black on a sideboard in my dining room three years ago and it's held up like a champ. So, I guess it's up to you. love love loveee this!!! 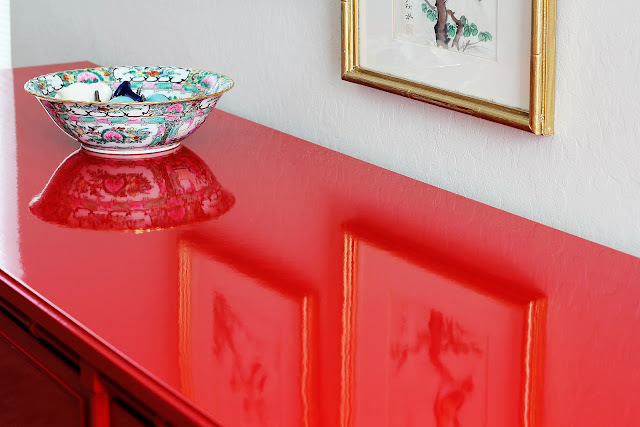 the deep red, the details and the way it's styled in the room. love it! So that's why I get air bubbles when I use Rustoleum Oil! Thanks for the tip!!! Another beautiful piece. And this time you brushed not sprayed? Even the drawers? I sprayed this one - but most don't have access to one. Good luck trying it out without a foam brush! WOW! I love this! Is it for sale? Love,Love it!! Have you ever tried the high gloss white? 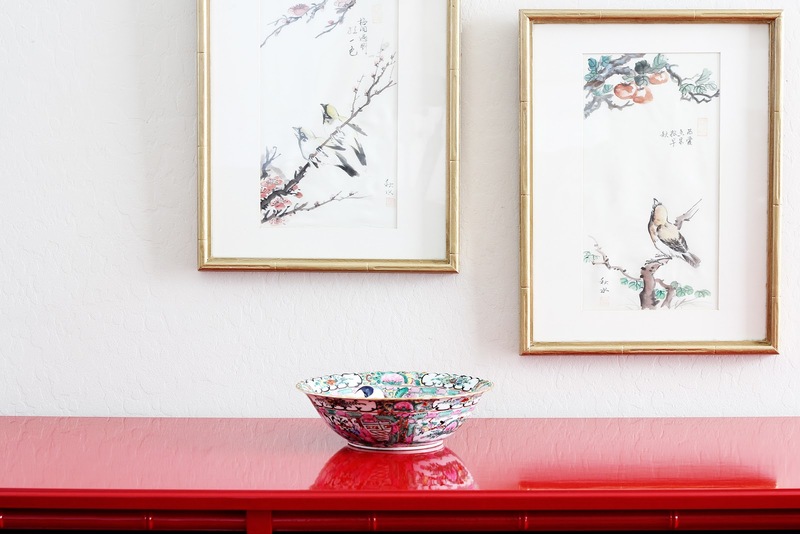 I have an ikea piece that is painted white, but I want that laquer look. Should I prime first since it is already painted? Do you think I could get the same look from the rustoleum protective enamel spray paint? Sorry for picking your brain,but I've never painted with an oil base before and i'm a little nervous. Yes! It's a very cool white - no yellow. Priming shouldn't be necessary, but you'll need to scuff it up enough to grip the paint. I'd start with a 150 then a 220 and finish with a 320. I used the spray paint on my nightstand drawers two years ago (ikea unfinished wood and didn't prime) and there's not one chip. They've held up amazingly. The only issue is on large surfaces it's hard not to get streaks with spray paint. Thank you so much for the advice. I think I will give the brush a try for the nightstand. I really want that glossy lacquer look, and try the spray for a vintage lamp I'm rehabbing. Thank you again for sharing! ps your family is adorable!!! OOH LA LA! She is a GLOSSY BEAUTY!!!!! ♥♥♥♥♥♥!!!!! Oh my. I'm in love. I can't take my eyes off the gloss. This piece would make a beautiful focal point in any room. Wow. I've been wondering about a paint for a good gloss finish, thanks for the tips!! Love this piece and it is perfect in red. Beautiful work! I tend to shy away from oil based paints. I used them years ago when there weren't as many options as today. Your dresser turned out so professionally - so gorgeous, that I am going to have to give oil based paints another try. Thanks for the great tips! It looks gorgeous, as if you purchased from a high-end store! 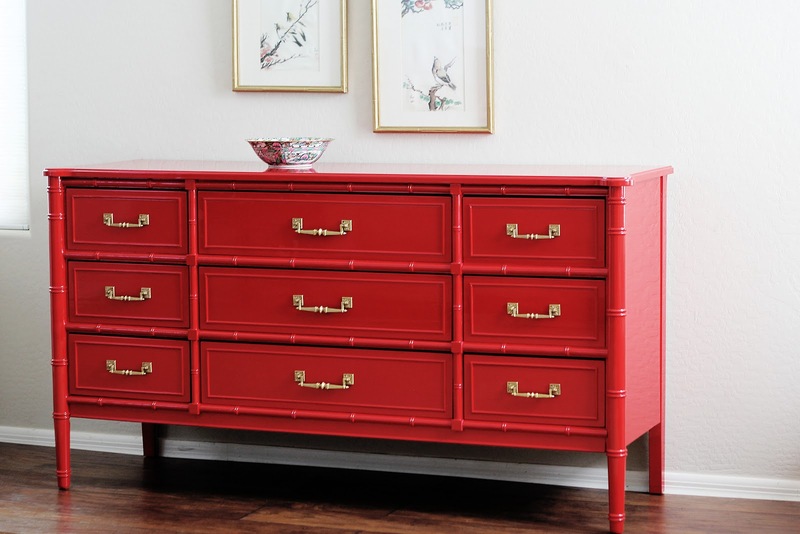 You got me looking around for a piece of furniture to paint red. I was wondering if the self-leveling feature of the paint works when you are painting something vertical...like the sides of a dresser or buffet? Or do you need to stand the piece up on it's end to paint the sides. Vertical surfaces self level better than horizontal surfaces when spraying, but I'm not sure that it makes much of a difference either way when brushing. The one positive to vertical surfaces is that they don't collect dust particles as readily - there is a problem with horizontal surfaces with oil based paints especially because the dry time is so extended. Try painting your drawers upright and then turning them on their sides to dry and you'll avoid dust settling. 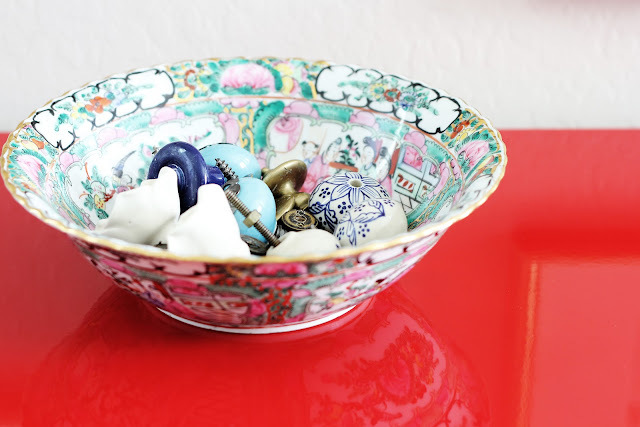 The lines of the piece are amazing, obviously, and the color is perfect! In the past I used latex paints in my sprayer and followed up with several light coats of Polycrilic. Unfortunately I have learned the hard way that it doesn't hold up. Luckily these pieces were just for my own use, so I can touch them up. However, I have a bunch of pieces in my basement workshop waiting for me to get my act together and paint them to sell. Once I realized a couple months ago that you use oil-based paints, I figured I should do the same. I also know that Jenny @ Little Green Notebook is a big enamel fan, and she uses a brush rather than a sprayer. Recently I bought my first can of Rustoleum enamel, in Gloss Royal Blue, and thought I'd try it out on a nightstand as my guinea pig project, before I move on to something more substantial. Hopefully all will go well. I know Jenny likes Rustoleum Safety Red, which is super-bright. I like the Sunrise Red color that you used as well. From the photos, it seems to be a softer red. I'm going to go with a brush this time, but eventually I'll work up the nerve to use it in my sprayer. How do you dispose of your mineral spirits?